The original Universal Audio 1176LN designed by Bill Putnam was a major breakthrough in limiter technology-the first true peak limiter with all-transistor circuitry offering superior performance and a signature sound. 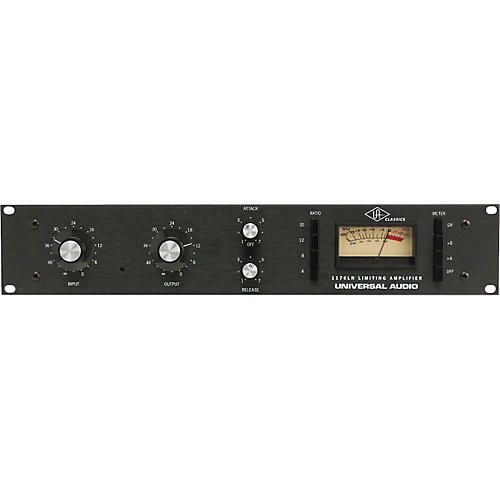 Evolved from the popular Universal Audio 175 and 176 vacuum tube limiters, the 1176LN retained the proven qualities of these industry leaders and set the standard for all limiters to follow. Today, the 1176LN is new again. While it certainly would have been possible-and much simpler-to modernize and "improve" the 1176LN, Universal Audio made every effort to remain faithful to Putnam's design and intentions. Carefully trained staff hand-wire and test each unit to uncompromising standards. This version of the 1176LN captures all the nuance of the original through obsessive attention to detail and delivers that trademark sound. Demand the original. Accept no copies.